You may be asking yourself what kind of guy would be willing to put his own surname up for sponsorship? Jason Sadler would be that guy. Having previous started a website called iwearyourshirt.com, he's taking it to the next level in 2013. This time, Sadler's selling his last name to the highest bidding sponsor. Before you laugh, Jason _________'s sponsor will actually be getting some serious buzz thanks to the social clout that Jason Sadler has built up over the past few years running iwearyourshirt.com. 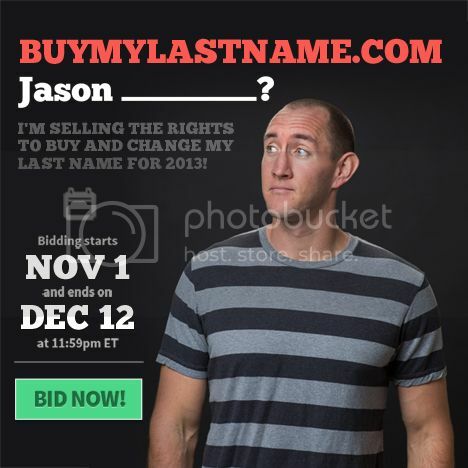 Sadler has been featured in outlets like the New York Times and Today Show, has racked up nearly 40,000 followers on Twitter and recently lanched this nifty social media site, buymylastname.com, where prospective sponsors can... you guessed it, bid on his last name. An hour into the 40 day auction, a $5,601, has bid to change his name to Jason WATERISLIFEDOTCOM.